Even though I already had most of the ingredients on hand, I just couldn't get myself up and out to the grocery store to buy the few things I needed for my feast of St. Joseph minestrone yesterday. It was a lazy day at home--I mostly worked on some finishing for the knit shop and took some White Bean Stew out of the freezer. So today I thought I should make something Italian in honor of St. Joseph, although since I'm not Catholic I doubt my lack of activity yesterday meant anything to anyone but me. But what to make? I still hadn't made it to the grocery store so I had to rely on what I have on hand. Which is: garlic, canned tomatoes, and pasta. And a flash of inspiration: some not-so-fresh spinach that should have been eaten days ago. I was going to saute it in olive oil and garlic and then make some pasta sauce when I had my magical thought. Why don't I just add the spinach to the pasta sauce? This sauce is a recipe I've been making for the past couple of years, and I've pretty much perfected it. The final touches came from Mario Batali's Molto Italiano: 327 Simple Italian Recipes to Cook at Home. His basic tomato sauce recipe called for thyme and basil. What? No oregano? I was skeptical to say the least. But I tried it, and, with a nod to Mikey's sibs, I liked it. A lot. I still use oregano, but not for this recipe. The thyme and basil give the tomato just the right amount of sweetness; sometimes oregano can be overpowering. I also don't put onions in this sauce. I'm not sure why that is, but after years of putting onions and garlic in *everything* I make, I've decided there are some things that are better without both (but never either). Maybe it's because I can taste more subtle flavors since I quit smoking, but I like to mix things up more now than I used to. It's a pretty standard technique. I use whatever vegetables I have on hand for this. Tonight was actually the first time I used spinach. I often use Trader Joe's frozen artichoke hearts, which I add while the pasta is cooking, or zucchini, which I saute with the garlic. Sometimes I'll cook an eggplant in the microwave and scoop it into the sauce at the end. This is especially good with polenta. Fill pasta pot with water and turn heat on high. Heat oil in large skillet. Add garlic and saute until just translucent or golden brown, depending on your mood. Add salt and pepper toward the end. Add tomatoes, thyme, and basil. Bring to low simmer and cook for twenty minutes or so, until sauce thickens. When water for pasta is boiling and sauce has thickened, add pasta to pot and cook per package directions. Add spinach to sauce, stirring until spinach has reduced into the sauce. 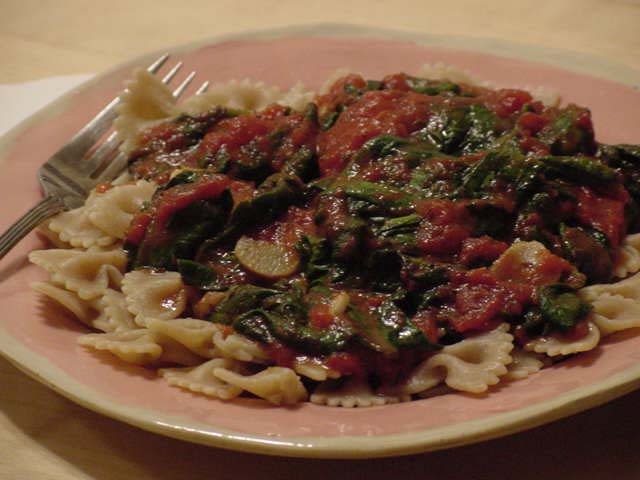 By the time the pasta is cooked, the spinach should also have cooked into the sauce. Serve sauce over drained pasta.